The macOS 10.14.4 update, currently available to developers, introduces a new AutoFill feature designed for Touch ID-equipped MacBook Pro and MacBook Air models. As iMore points out, in the Touch ID section of the Settings app on macOS 10.14.4, there's a new "Safari AutoFill" listing you can enable. With Safari AutoFill enabled for Touch ID, you can place a finger on the Touch ID home button to automatically fill in web form content. Right now, you can use AutoFill to enter usernames, passwords, addresses, phone numbers, and credit cards, and more right into web pages, but you generally have to click into a form and then start typing before the AutoFill option comes up. It sounds like the new Touch ID Safari AutoFill feature will streamline the process, filling forms with a touch. macOS 10.14.4 also expands Apple News to Canada and it introduces automatic dark mode themes for websites, so if you have Dark Mode enabled and visit a website that has a dark theme available, it will be activated automatically. Not quite sure of the security or cost ramifications, but would love to see Touch ID added to their desktop keyboard. Face ID built into an iMac would be great, but a keyboard solution could bring new technology to an older computer. They can't even ship a backlit wireless keyboard, let alone change the finish to space gray, so I wouldn't hold my breath for Touch ID. Old computers don't have the Secure Enclave necessary for this technology. It would also cheapen the overall experience. The Secure Enclave would be built into the keyboard, I’m sure, if they ever did this. I'm not sure of how feasible this idea is, but for the iMac / Mac mini / Mac Pro, would it be possible for the Secure Enclave to be built along with the Touch ID sensor in the wireless keyboard? The keyboard would have to be paired only to one Mac, but could communicate a simple Yes or No response when it scans for a fingerprint match. It seems cumbersome to have to turn the desktop or reach around the back each time you want to use Touch ID. And I thought Apple was killing off Touch ID. They didn’t say that in so many words. A bit of a mixed message. Face ID would make so much more sense on a Mac than Touch ID. It would be fast and seamless! TouchID won't be added without a Secure Enclave processor AKA a T2 chip (or newer). That would effectively make such a device a rather powerful keyboard. It would also be expensive and likely cause battery life and heat issues. I think you're far more likely to see FaceID included in a future iMac release, so that way all of the hardware can be embedded in the computer rather than a peripheral. 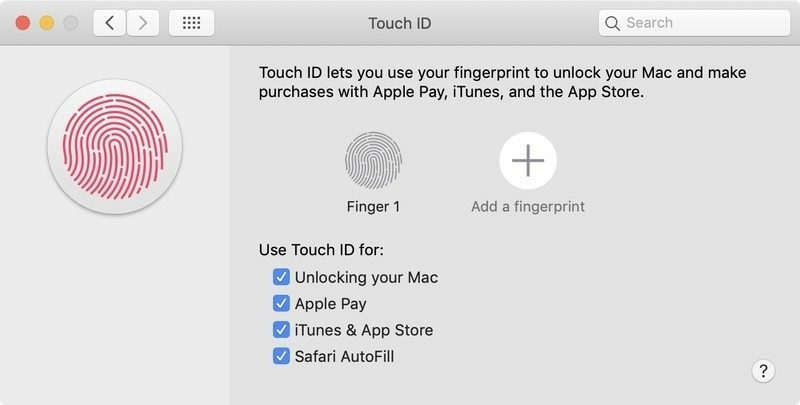 Why can't I use Touch ID from my iPhone 7+ to validate a purchase on my MBP? And I thought Apple was killing off Touch ID. Touch ID is not outdated technology. It's just a different, secure way to authenticate. They are phasing it out on their phones in order to have an "all screen" experience. Macs are different devices. Hands are on the keyboards all the time, so Touch ID is reasonable there. But that said, I think Face ID on Macs makes perfect sense, until people start getting paranoid and taping over the camera area. I just want a way to turn off Safari auto-generating passwords when I register for things! Why? If you're set up properly, that generated password gets stored into iCloud Keychain, and you never need to worry about it again. It's magically available on all of your Apple devices. Grab your phone and you can log into that same website without knowing the password. The days of users choosing their own passwords is behind us. And you do have control over this new feature. It's entirely optional. Since getting an XR and using Face ID, I very much prefer it over Touch ID. Never thought I'd feel that way, but it's so transparent in term so using the device. I'm already looking at it, and it magically authenticates.